frica Awaits Tours and Safaris is a tour operating company specialising in exclusive self-drive itineraries, guided tours and fly-in safaris within Southern Africa. Discover with us the Africa that you have always imagined - the Africa that Awaits you! Whether it is the diverse cultures, the vastness of the sky, the natural beauty of the landscape or the unique attraction of wildlife, there is something special about Africa that once experienced will draw you back. 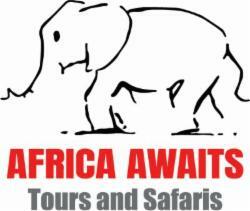 Africa Awaits offers you an exciting way to tailor make your visit to this majestic region. Our aim is to provide you with an unforgettable holiday in the truly magnificent surrounds of Southern Africa. Since August 2000 Africa Awaits Tours and Safaris has offered a limitless variety of itineraries to suit our clients from around the world. Your trip will be carefully planned according to your specific requirements, special interests and budget. Allow us, with our experience and extensive product knowledge, to guide you in your selections. Experience the Africa you have always imagined. We look forward to meeting you in Africa! Southern Africa is our forte - with trips to East Africa an option. Take a look at some of the areas that await you and contact us to make your visit a reality.